After reaching the money cap, I wanted to end making money, therefore playing, therefore blogging about it. 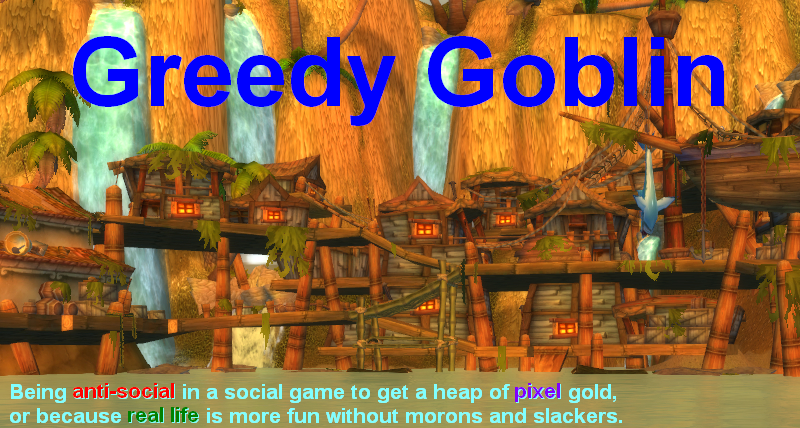 I got lot of comments and even mails, "demanding" more goblinish posts and goldmaking tips. On the one hand I'm happy that I made such impact. On the other hand, collecting gold pointlessly just make me and the "goblinish view" look stupid. I already collected way more gold than I could spend. Such pointless activity rather repel people from the goblin way than attract them to it. So I came up with an idea, an extended form of "goblin raiding". I will finance a raiding guild, so they can focus on raiding, don't have to spend their time farming consumables, enchants, crafted stuff and so on (or at least not as much). I look for a well-progressing raiding guild, that deserve this funding. I won't support "freindly social ppl". I still can't be an ordinary raider, partially because my playtime is limited, but also because the first weeks after patch are the bests for moneymaking, so no matter how much playtime I have, my place is by the AH and not in some instance. 5000G/week to the guildbank. That's 260000G/year. Selling guild acquired items for a good price. Giving personalized gold-making tips for guildmembers. Payment for every items I get on raids. Of course I only take items that are not needed to a raider-mainspec. Crafting for both the guild and my own businesses. I send the guildmember the mats in a mail, he crafts the item when it's convenient and sends me the product. 1-2 raids in the "not firstkill but not altrun either" period, somewhere 3-4 weeks after firstkill, when it's still challenging (for me). It's quite OK for me to be in the starter group cleaning the first bosses, and when the progression bosses come, leave the instance. If I keep on wiping the raid, I accept being switched out. I'm fully aware that while I'm not a bad raider, I'm definitely not someone you want on a server firstkill. I have dual healing spec, 2030 healing, 375 casting MP5 in tree form and ready to do any healing job. Raids (or at least my presence in them) must end before 23:00, as I have work next day. Guild must be on an EU-english realm, horde side, english- or hungarian-speaking. If the inviting guild contains a fellow blogger (with a good blog), that is a big pro for that guild. I would keep on blogging, but it could barely affect the guild as I won't be near the drama-heated situations, and my visitors surely don't expect guildwatch here. But if you want to keep the business-related things like "I sold 2 [uberpriestnecklace] for the guild for 7 zillion G" in secret, I'm not the best choice for you. Comments are not allowed for these post, I'd like to get the offers to my mail. Of course my offer-demand list is not "take it or leave", I'm ready to negotiate points. Please note that I am unable to pay a one-time fee, as Blizzard only allow the transfer of 20000G. So I have to buy items on my current server, and sell them on the new one. Obviously these will take time, the former will take about a week (before the transfer), the latter will take months. So I won't have much (in goblin terms) money in the first weeks on the new server. Click on the goblin head on the header for mail. If I find a proper guild to transfer to, I'll keep on making money, therefore playing, therefore blogging. If I cannot, that means that making gold is not really valuable to a good guild. This case I made a mistake by focusing on making gold in a game that does not need/support that. So if I cannot find a proper guild, this was my last post. I hope it's not the case. So if you want further goblinish ideas and gold-making tips, shop around for me in your server.